In January 2018, Amazon announced that "After a thorough review of our service offerings, we've made the decision to discontinue CreateSpace's paid professional editing, design and marketing services." Although the press release did not specify an exact date for the end of these services, it appears that it will be in mid-2018. The CreateSpace website makes no mention of this change. This does not affect CreateSpace's P.O.D. printing options, which will remain in place and we still recommend the printing services. Our original review - There are two parts to CreateSpace, or maybe more appropriately, there are two ways to use CreateSpace. This review is only for the portion of CreateSpace that provides publishing services such as editing and design. It is not about CreateSpace as a POD printer and distributor, which is reviewed here. 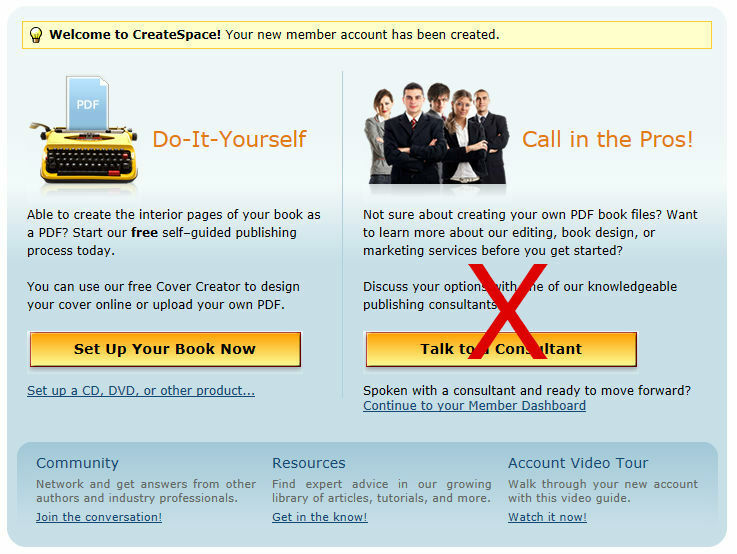 As you work through the CreateSpace website, these services fall under the "Talk to a Consultant" and design services. Similarly to Lulu.com, there may be times when utilizing CreateSpace design services are appropriate. Let's say you are doing a simple book of stories written in a classroom and only want to make them available to parents, grandparents, and friends. Or you want to make a family collection of recipes or family anecdotes available for your far flung family to purchase. Then use Lulu.com or CreateSpace design services to set up the book for sale. However, if you are looking for commercial success for your book, do the design elsewhere and then upload it to the Do-It-Yourself part of CreateSpace. What CreateSpace does well is print and distribute your book, through Amazon, using Print-On-Demand technology. Amazon, first and foremost, is a technology company. They aren't a publisher, so don't use them for editorial services, typesetting, or cover design. Only use CreateSpace to print and distribute your book through Amazon. Do not use their design services unless you have a simple book and only want very limited distribution, such as to a club, classroom, or friends and family.